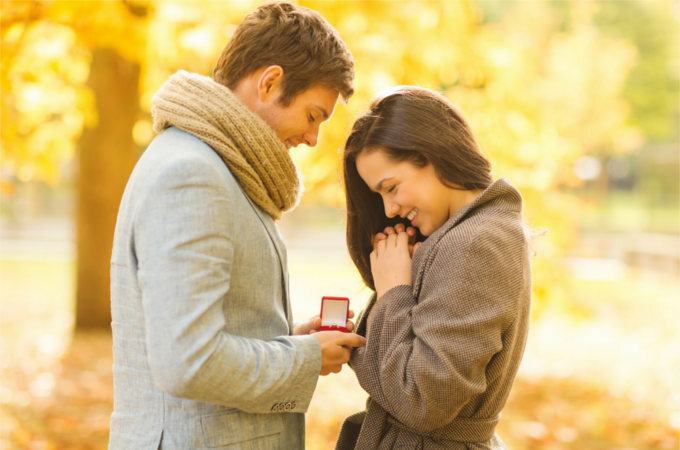 Engagement rings; the quickest and easiest way of saying “I’m taken”. Often (but not always) given by a man to his long term partner as an agreement to marry, the engagement rings of today can be expensive and opulent, or plain and simple. There is an extensive choice of different engagement rings to suit all couples, plus a number of jewellers also specialise in bespoke jewellery, so you will never be stuck for choice when looking for the perfect engagement ring. However, engagement rings weren’t always the band of gold adorned with a few precious gems that we know them to be now. Let us take a look at the backstory of the engagement ring, and see how it has transformed throughout modern history. The earliest known record of an ‘engagement ring’ was when Neanderthal males would place braids of corded grass around the wrists, ankles or waist of a woman they wished to ‘partner’ with. Researchers believe this corded grass braid to have been part of a ritual, where the male sought spiritual assistance through the braid in order to bring his mate’s ‘spirit’ under his control. It wasn’t all bad, as this bond was also supposed to represent both loyalty and friendship, and it was thought that those women with the braid lived longer than those without. The Ancient Egyptians are often credited with the creation of many ‘ring traditions’ we still hold in significance today. The Ancient Egyptians were the first to adopt a circular band as a symbol of engagement, as it was said to represent the unending love between two people. The Egyptians utilised a number of different materials in order to make their rings, including those from ivory, hemp and bone. They would later discover that metal could be used in order to make rings, and this was known as ‘ring money’. The Roman Empire brought about the new tradition of the ‘gold’ engagement ring. In fact, brides-to-be were to be given two different rings by the groom; one of gold and one of iron. The gold ring was worn at the wedding ceremony and to any and all special public events, whereas the iron ring was worn at home while performing the household duties. This was a sure-fire way of keeping the more valuable ring safe until it could be displayed at important social gatherings. The inclusion of this statement in their laws helped to pave the way for a new set of rules defining marriage. It also discouraged the use of ‘fake’ rings as a means of deceiving the bride-to-be as the giving and accepting of the engagement ring was now a binding contract enforceable by law. It is not known exactly why the ring should have been made from diamond, perhaps it would represent the Archduke’s ability to care for and keep his wife? In 1867, a huge deposit of diamonds was located in the Cape Colony in South Africa. Unfortunately, at the time diamonds were only worn by the social elite, and even these orders had dwindled drastically during the First War and the Great Depression. The launch of the “A Diamond is Forever” Slogan by De Beers in 1947 after the company monopolised diamond prices worldwide, made the diamond engagement the most desirable ring on the market. As we have reached the end of the 20th century and moved into the 21st, the diamond has started to become old news. More colourful gemstones are considered rarer (to see), more exotic and more unique, so the jewellery market has been seeing a decline in the use of diamond rings. However the diamond is such a beautiful gem, it is unlikely that it will ever disappear from the market entirely.